Ahmadinejad's UN visit this week shows how much things have changed in the past year. Mahmoud Ahmadinejad was back in New York this week, making his fifth annual pilgrimage to the UN General Assembly. 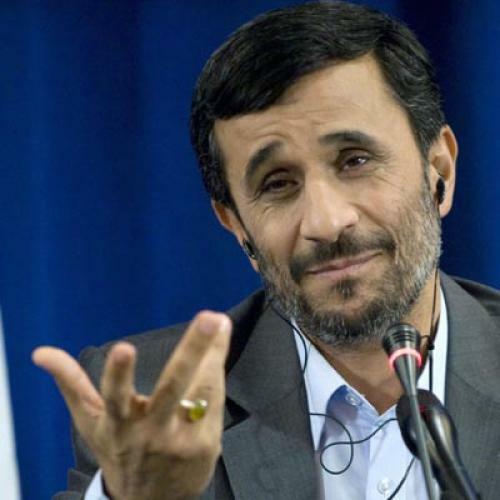 In the past, Ahmadinejad's carefully calibrated theatrics before or during his trips--comparable only to his new soul-mate Hugo Chavez, or the equally delusional, self-declared messiah, Moammar Qaddafi--focused all attention on the regime's nuclear adventurism, or his own shameless denial of the Holocaust and repeated demands for Israel's "oblivion from the map." His glib sound bites were broadcast with astonishing repetition. Journalists, with occasional exceptions, eschewed more probing questions about the failing economy in Iran and the plight of political prisoners and minorities. This "rock star" attention fed--indeed, increased--his narcissist appetite for the gaze of the camera. His own fabricated stories about the trip--that Allah provided a protective cocoon while he spoke at the UN, or that American children screamed words of support in New York streets--were craftily propagated upon his return, to be consumed and delighted at home and in the Muslim street. For example, after his appearance at Columbia University in 2007, official and semi-official Iranians papers hailed his "heroic" and "civilized" behavior in face of an "ill-mannered president;" even reformist offered praise. But this time, Ahmadinejad came to America not as a charming populist or an amusing sideshow, but a petty despot. The Iranian struggle to declare the June 12 election fraudulent, and the regime's ensuing brutality, has torn asunder his bumbling façade. His very claim to represent Iran continues to be stubbornly rejected by a surprisingly large number of Iranians as well as leading Shiite clerics. Ayatollah Hossein Montazeri, the leading clerical dissident in Iran, has asked other clerical leaders to side with Iranian people in their struggle against the regime. Nothing short of the future of Islam is at the stake, he said. Already many ayatollahs in Iran, and at least one in Lebanon, have heeded the call. The embarrassment of Moscow-style show trials, where erstwhile regime stalwarts are coerced to confess to comically fantastic conspiracies--most notoriously the charge of a conspiracy to teach Max Weber and Jorgen Habermas--have exposed his claims of representing a unified nation defying the will of the United States and the UN. This week's trip to America was different. Both the Iranian and America media either ignored him--the worst punishment for an insecure narcissist like him--or asked the hard questions that make it more difficult for him to hide behind his usual snarky arrogance. Katie Couric's questions about the death of Neda Agha-Sultan during the post-election riots clearly threw him off his stride and forced him to change the subject. In the past, journalists were worried about not being allowed back into Iran if they asked controversial questions; like Russia today and Soviet Union before it, the clerical regime has mastered the art of using visas as an inducement to some measure of self-caution, if not outright censorship. But now that most journalists have been thrown out of Iran anyway, the tactic no longer seems to be working. Moreover, this time citizens of New York, as well as Iranians from all over the Diaspora, converged around the UN and Ahmadinejad's hotel to demonstrate against the fraudulent election that lead to his second term. The several thousand people who protested against him--as well as the presence of so many green-clad Iranians in the crowds--put an unprecedented damper on what is usually a victory lap for Ahmadinejad. His trip was also bereft of invitations from groups like the Council on Foreign Relations and the World Council of Churches that welcomed him in the past. Such a reception makes it harder for leaders of Western democracies, particularly the Obama administration, to simply ignore the Iranian opposition and offer the regime the "grand bargain" it now needs more than ever. President Obama's declaration at the UN that people everywhere must have the right to determine their own future, and the Russian president's declaration that his country might be willing to join the world in isolating the regime, are important signs of a sea change. (Support from Russia is arguably the most important element of the Iranian regime's false certitude that the world will never unite to force them to accept the will of the people.) The half-empty hall when Ahmadinejad delivered his rant at the UN was another indication of the new reality. His chilly reception in the United States did not go unnoticed back in Iran. Usually his return from his yearly UN pilgrimage is accompanied with a propaganda campaign describing his valiant success in standing up to "world arrogance" and defending the Muslim world. This time, however, ignored by much of the media, he is returning home to the discovery that the regime has, again, lied to the world about their nuclear program. On the day of Ahmedinejad's return, usually reserved for fawning coverage of his trip, the Iranian media outlet Fars Press trumpeted as their top headline a David Ignatius Washington Post article (in which Ignatius describes the president as a dangerous man with delusions about saving the world) by saying that Ignatius praises Ahmadinejad as "a true revolutionary who wants to change the structure of the global system." The fact this is the best that the government-controlled media can muster is a stark illustration of the new reality Ahmedinejad faces at home.